You can use any type of milk you like (including soy milk), remembering that the higher the fat content, the richer the chowder will be. In a 3- or 4-quart (2.8 to 3.8L) pot, heat oil and sauté leeks and onions for 4 minutes on low heat. Do not brown them. 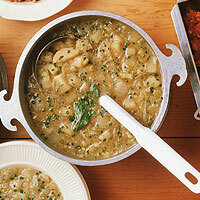 Add potatoes, stock water, thyme, and caraway seed and bring to a boil, uncovered. Lower heat, cover pot, and cook about 20 minutes, until potatoes are almost soft. Add kale, salt, and pepper. Cover and cook 10 minutes longer or until kale is tender. Add milk to taste, adjust seasonings, simmer 5 minutes longer (without boiling), and turn off the heat.